Hotel Grand Laxmi Vilas Palace Udaipur, Grand Laxmi Vilas Palace Hotel Udaipur, Reservation for Hotel Grand Laxmi Vilas Palace, Udaipur, India. 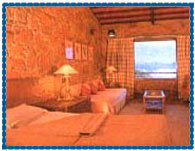 Address: Fateh Sagar Lake, Udaipur-313004, Rajasthan, India. Accessibility: 27 kms. from Airport, 6 kms. from Railway Station, 5 kms. from Bus Stand. 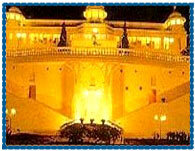 Hotel Grand Laxmi Vilas Palace was built by Maharana Bhupal Singh as a royal guesthouse. Hotel is situated on the hilltop overlooking the serene Fatehsagar Lake and recreates the courtly and graceful ambience of an era. Hotel offers all of the amenities, facilities and levels of comfort expected from a hotel of this class. Hotel offers well appointed 54 rooms categurised into 47 doubles, 6 royal suites and 1 Maharani suite, providing all the facilities like attached bath, hot and cold water, telephone, colour TV, cable/Star TV etc. Currency Exchange, Doctor on Call, Laundry, Parking, Safety Deposit Box, Room Service, Boutique, Vehicle Hire, Business Facilities, Banqueting, Conference Room(s), Function Room(s), Boating, Cultural Shows, Puppet Show, Shopping Arcade, Swimming Pool, Tennis Court, Tours Organised, Padmini Restaurant, Sagar - The Bar.